award winning actress Virginia McKenna, Robert Daws, Amanda Waring, David Simeon and introduces Emma Frow and Hugo Maudsley. 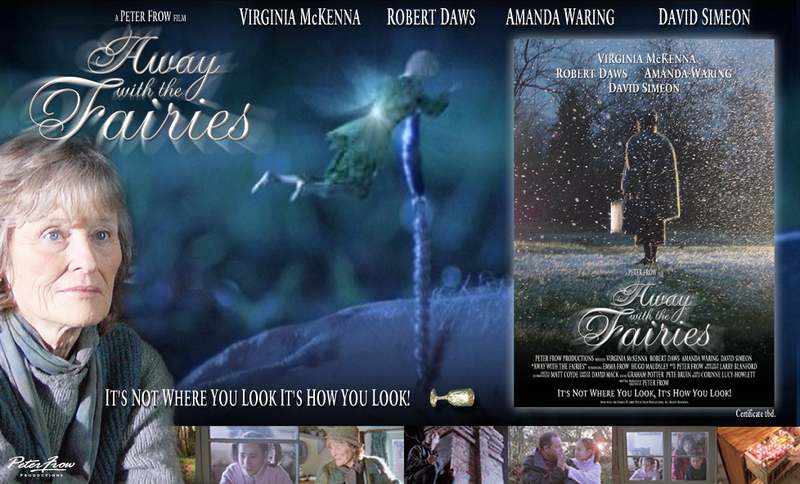 “Away with the Fairies” is a short family film, written, produced, directed and music by Peter Frow and shot by Director of Photography Larry Blanford (Fantastic Four: Rise of the Silver Surfer), about an eccentric Grandmother (Virginia McKenna), who after being missing for months turns up in hospital apparently having been to Fairyland. Her daughter (Amanda Waring) and son in law (Robert Daws) take her home to her woodland cottage where the truth of her disappearance unfolds. “Away with the Fairies” is a tale of wonder, mischief and fairies at the bottom of the garden - It’s not where you look, it’s how you look! AWAY WITH THE FAIRIES COPYRIGHT © 2010 PETER FROW PRODUCTIONS. ALL RIGHTS RESERVED.